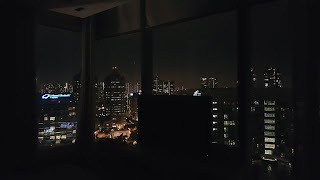 Staycation at Oasia Hotel ~ Journal of a dreamer. Grumpy Cat was feeling really apologetic that he couldn't spend our first Christmas together as he would be overseas, so he asked me around 3 months back if I'd like to go on a staycation with him. As luck would have it, Oasia Hotel was running a promotion at that time, so Grumpy decided to book it for our one-night staycation. I was really excited as it would marked the first time I would be having a staycation, and the photos of Oasia Hotel looked really good, so I couldn't wait for Friday to come. Both Grumpy and I took the afternoon off. 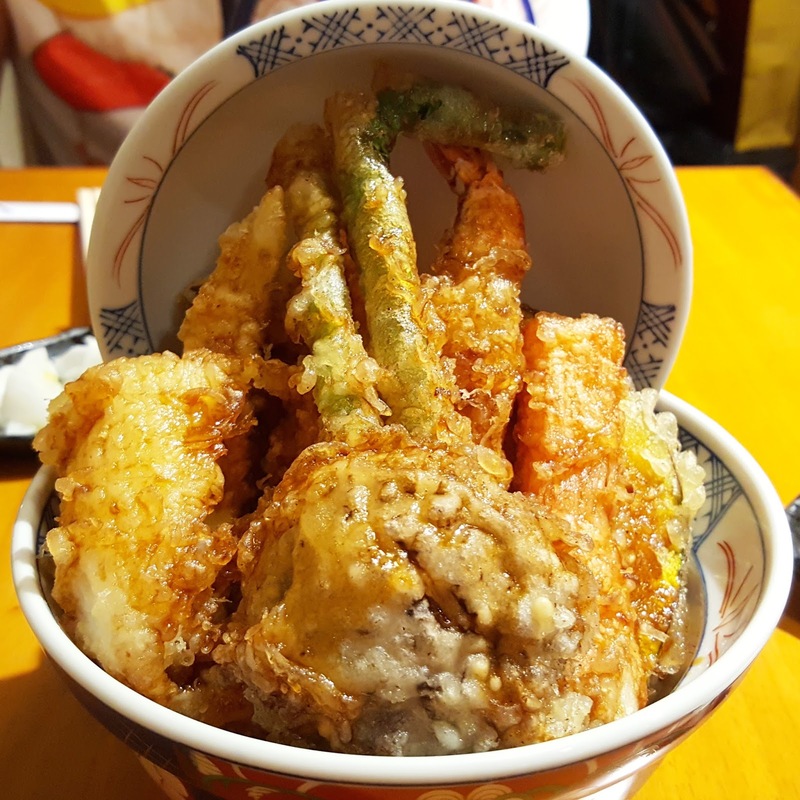 I was really dying to try out the tendon at Tendon Kohaku, which is located at Suntec City. The first time I went there, it was during dinnertime, and the queue was still very long at around 8 pm. My friends and I decided to drop out of the queue and went to Pasarbella to fill our stomachs instead. We decided on our orders really quickly, and waited a further 20 minutes for our orders to arrive at our table. I must say that for $15++, this bowl of tendon was really very good. As Grumpy put it, it was crispy without being oily and heavy, something which I put down to the chef having the right skill of cooking. The ingredients used were really fresh too. I enjoyed every single tempura that was inside, from the mushroom to the corn, from the prawns to even the chicken breast. In fact, the standout for me was really the chicken breast. It is the part of the chicken which I hate eating the most lol, and yet this piece of chicken breast was done so wonderfully that I forgot I was eating it... the breast was really tender and juicy. In fact, the first time I truly liked eating chicken breast was from this shop at Raffles XChange called Ice Queen (so much love for this shop still). I can finally say that I've finally found another place where I can eat chicken breast in Tendon Kohaku. I totally won't mind coming back here again, minus the crazy queues of course. I felt really very stuffed from the tendon, but Grumpy had other ideas. He wanted to try out the churros cheese tarts at Nigiro Café, which is located along the same stretch as Tendon Kohaku. I was protesting, but decided to go along with Grumpy's whims hahaha. The cheese tarts were made to order, so we had to wait around 20 minutes before our cheese tarts were brought to us. 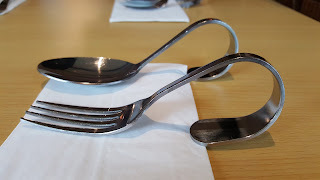 They had very interesting utensils, but I didn't think they were easy to use though... ._. 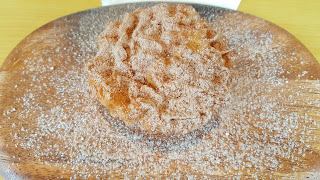 Our churros cheese tarts finally arrived on a wooden board, which was coated in cinnamon and icing. 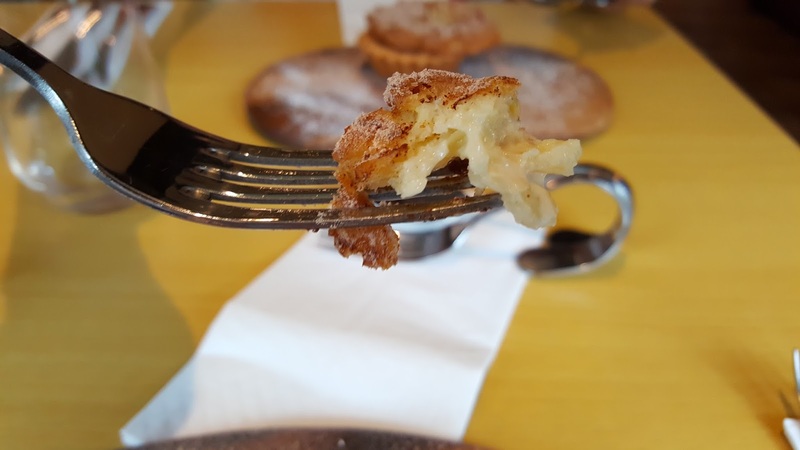 The churros (tbh it just tasted like pastry topped with cinnamon and sugar, not the chewy churros texture I was expecting per say) formed the top of the cheese tart. Beneath it was molten cheese. This cost $4.80++ per tart. Grumpy found this really good and would totally have it again. 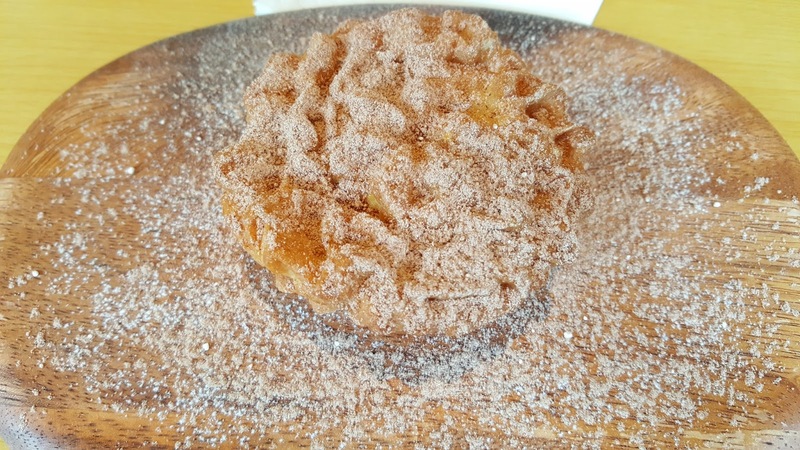 I found this nice as well, but honestly, I wouldn't specially come back here to have the cheese tart, probably because I'd rather eat the real churros than just some pastry dough topped with cinnamon and sugar lol. After deciding that we've had enough of food, we proceeded to Novena, where our one-night staycation was at. After checking in, we proceeded to our room, which was located right at the far end of the corridor, away from the lift lobby. 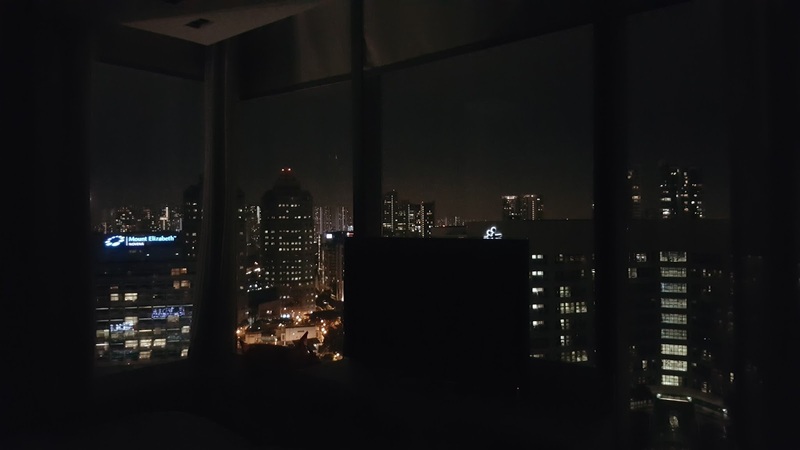 Our room's view was really spectacular! We had full-length windows, which gave us a bird's eye view of the surrounding buildings as well as a fantastic scenery. Grumpy had to settle some work-related stuff, but thankfully he had already come prepared with his stash of movies, so while he busied himself with work, I was left to entertain myself with Storks hahaha. After the movie was done, we left for dinner at around 7 plus. 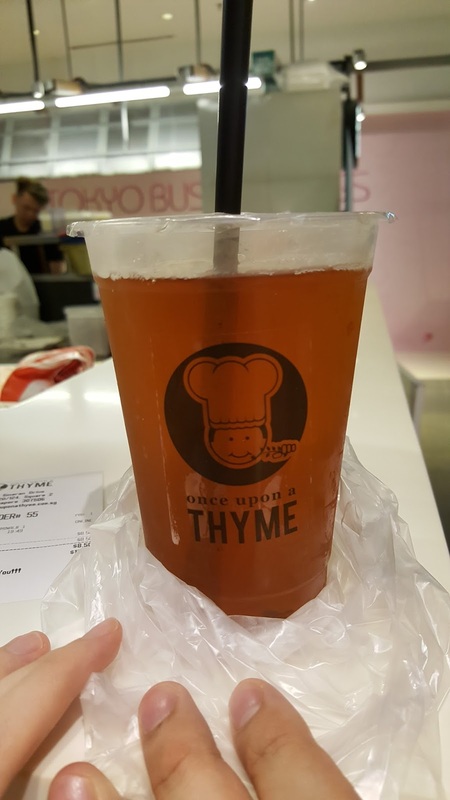 We chanced upon Once Upon A Thyme (located at Square 2) as we were making our way out of our hotel via the underpass. We both had been wanting to give this a try (I saw it at Central once), hence this was the time. 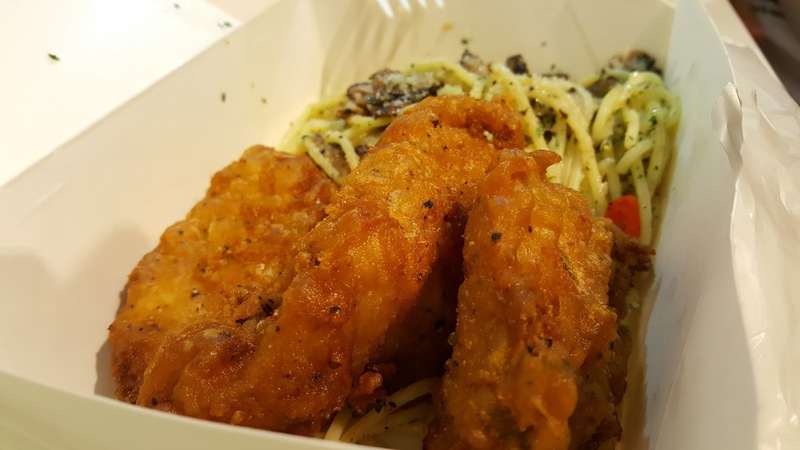 Our battered fish aglio olio was so damn good. At $8.50, we both thought that it was really worth the money! Sorry for the sloppy picture though because the lighting wasn't good and there were a lot of shadows forming. ;X This picture totally doesn't do justice to the food we had. We then decided to take a bus down to Whampoa food centre to get our dinner. There were so much good food recommended for this particular place on food blogs, but some had already closed for the day. Thankfully, we still did manage to settle our dinner with some very delicious food! We watched two more movies before we retired for the night. Check-out was at 12 pm, so both of us tried to make full use of the room facilities by vacating only exactly at 12 pm LOL. After checking-out, Grumpy brought me to Pek Kio Market, which apparently, is home to a number of stalls with good food too. As luck would have it, most of the food I had wanted to try were sold out already. Thankfully Grumpy was queuing for Soon Kee wanton mee, and bought the last few plates. ._. 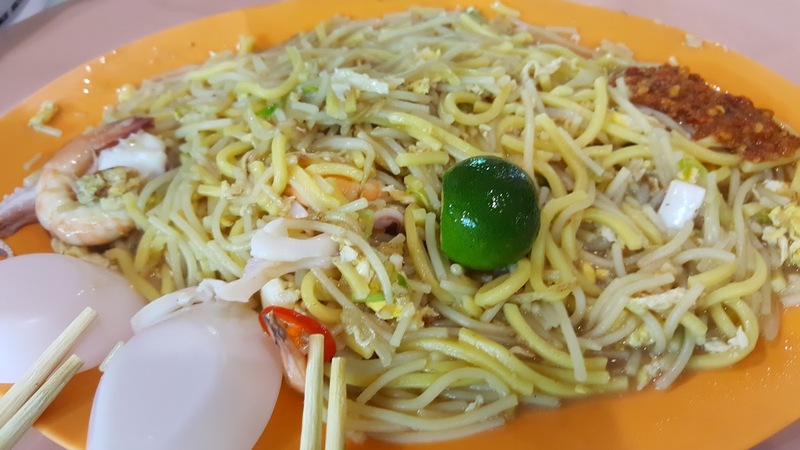 I'm more partial towards the HK-style wanton mein, so I wasn't expecting much from the wanton mee that Grumpy bought, but this was seriously good! The chilli really packed a punch, and surprisingly, the char siu slices were DAMN GOOD?! It overshadowed the wantons tbh. 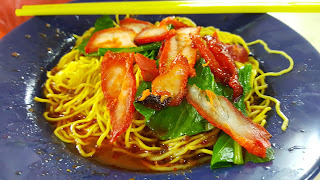 And this is really one of the rare times where I actually really enjoyed the char siu in wanton mee.